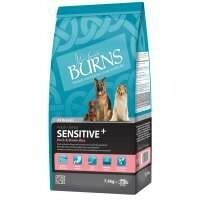 Burns Sensitive Dog Food Duck and Rice is hypo-allergenic and contains no dairy, wheat, soya or beef. It is also suitable for use with holistic veterinary treatment. This food is ideal for all adult dogs, including seniors, and contains no artificial colours or flavours. It is naturally preserved and uses free range duck to make up the minimum of 20% duck meat meal that this food contains. Better still, Burns Duck and Brown Rice helps to naturally maintain the immune system, coat, skin and digestive tract as well as the skeletal, respiratory and nervous systems. Contains no wheat, dairy, soya or beef. Suitable for use with holistic veterinary treatment. Ideal for all adult dogs including seniors. Made with free range duck. Contains minimum of 20% duck meat meal. Crude Protein 18.5%, Crude Oil 8.0%, Crude Fibre 2.0%, Crude Ash 6.5%, Vitamin A 25,000 iu/kg, Vitamin D3 2,000 iu/Kg, Vitamin E 100 iu/Kg, Moisture 8.0%, Copper 18mg/kg, Sodium 0.18%, Calcium 1.29%, Phosphorus 0.85%, Magnesium 0.09%, Potassium 0.29%, Chloride 0.19%, Sulphur 0.28%, Essential Fatty Acid 2.85%. I used to feed my Labrador Eukanuba, but wanted to feed a more natural diet, so I chose Burns. They love it, and soon let me know when the next meal time is.